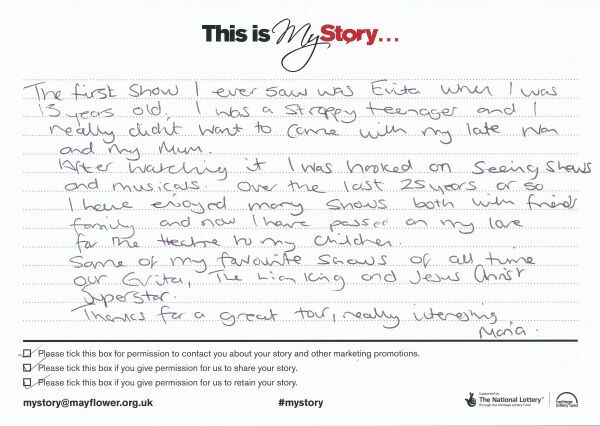 My Story card: Maria Moran remembers first getting interested in musical theatre and passing that enthusaiasm onto her friends and family. The first show I ever saw was Evita when I was 13 years old. I was a stroppy teenager and I really didn't want to come with my late Nan and my Mum. After watching it I was hooked on seeing shows and musicals. Over the last 25 years or so I have enjoyed many shows both with friends, family and now I have passed on my love for the theatre to my children. Some of my favourite shows of all time are Evita, The Lion King and Jesus Christ Superstar. Thanks for a great tour, really interesting.